The primary intent of Mathematics for Agriculture is to provide a relevant review of basic arithmetic, statistical interpretation, and algebraic concepts to prepare students for mathematics involved in other agriculture and horticulture courses. 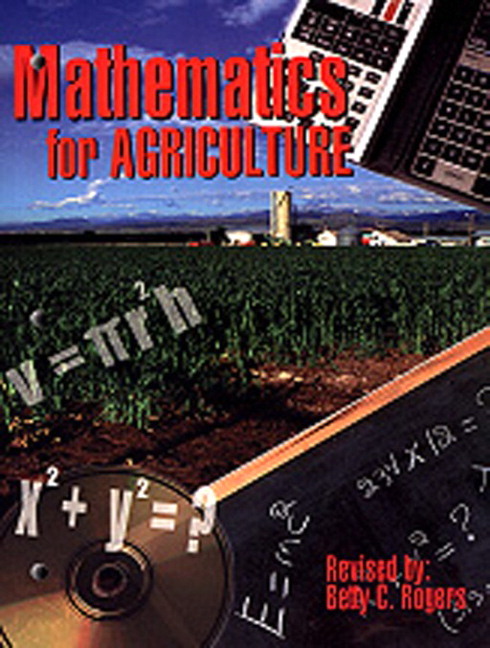 However, the book would readily lend itself for use as a general math text in an agricultural curriculum. The application problems use current and realistic agricultural situations similar to those encountered by professionals engaged in agriculturally related occupations and industries. Because the math skills required in solving problems in the text range from the very simple to the more challenging, the book can be adapted to various grade levels. Math plays an important part in everyone's life, but the increasing complexity of agricultural technology makes it mandatory that workers in agricultural occupations have skills in the analysis and solution of mathematical problems. A prominent unit on using both the English and metric systems and making conversions from one system to the other is provided. A separate Answer Key is also available. 5. Interpretation and Analysis of Data.